by Stephen Shea Morris From America tells the humorous but touching story of a 13-year-old kid from America who has just moved to a small town in Germany with his father (Craig Robinson). Morris (Markees Christmas) is a fish out of water and his new situation makes for an interesting and funny film about adapting to a new culture. Similar to the 2010 Karate Kid remake, this movie throws a boy into a foreign country where he stands out. Morris is a wannabe player who struggles to make friends in Germany. He tries to act laidback and confident with the goal of someday becoming a rapper. But he isn’t put down for his lofty dream of rapping, as his father had the same dream when he was a child. The father-son relationship in the film is wonderful, and this is a testament to Craig Robinson’s performance as Curtis. Robinson plays Curtis as a kind, nurturing father trying to do his best for his son. His character is struggling to pick up the pieces after the death of his wife and Robinson hits the dramatic notes perfectly. Curtis is a father who doesn’t keep a tight grip on Morris at all times; but, he isn’t afraid to punish Morris in some amazing reversal of expectations, further proving The Office vet’s instinct for comedic timing. Morris goes to wild European raves with his first German friend, Katrin, who is the object of his affection. Katrin opens Morris up to new experiences such as drinking, smoking weed and taking ecstasy. She shows him kindness which he naively perceives as love. Morris has dreams about Katrin and in one hilarious scene he even puts a sweater that she left behind on a pillow so he can pretend to practice his moves on her. The film is a straightforward coming-of-age dramedy, but it features a few slightly surreal moments, such as when Morris is exploring the local historical landmarks and arrives at a castle where all the visitors and statues bob their heads to the music. Along with some of the film’s other slight but unnecessary moments, I think that this scene could have been cut. The film already brands itself as surreal in its portrayal of a child stuck in a completely new place out of his element — it doesn’t need an extra layer of surrealism. 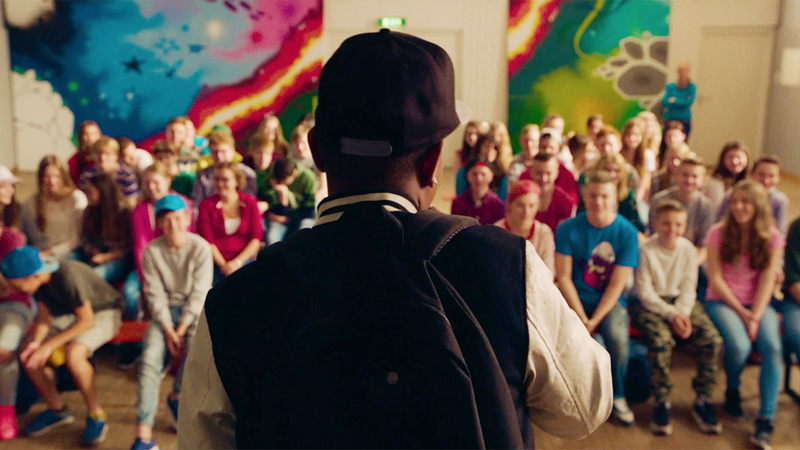 The film also has a few standout messages about hip-hop as it explores today’s music through Morris’s naive perspective on it. Primarily, director Chad Hartigan expresses the idea of staying true to yourself and your experiences as well as writing about what you know instead of what is successful or expected in the artform. Morris From America ends up being a poignant and often amusing film. It offers many hallmarks of the traditional coming-of-age narrative (a common story in films today), and if these narratives aren’t usually your style, this film won’t change your mind about them. However, if you are a fan of the genre and are looking for something with a more mature edge, this new addition should satisfy.